p(blue). 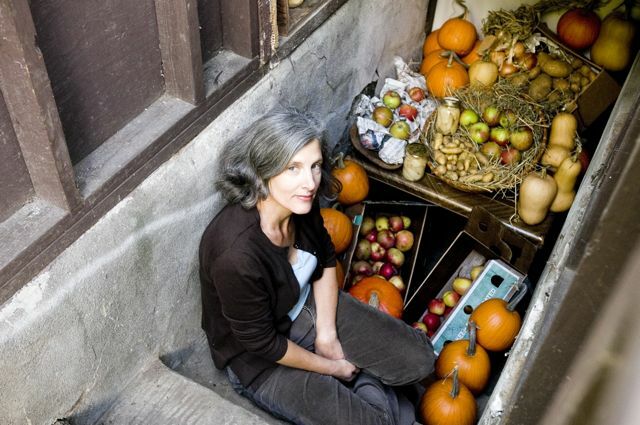 Editor's note: Harriet Fasenfest was featured in a recent New York Times piece on root cellars. Now that I am locked and loaded for winter and the rain is giving me permission to consider life from the inside out, I’m on to the next part of this experiment: planning meals from all the stuff in my packed pantry, freezer, and root cellar. Managing this is not as obvious as it might appear. More than one food preserver will admit to never eating some of the stuff he has so carefully prepared. Marge, my now-retired partner in Preserve, offers many cautionary tales, such as, “If you don’t like applesauce, don’t make it.” Easier said than done, Marge. When you have lots of apples to contend with, and applesauce is oh-so-easy to make, you inevitably end up with lots of jars staring you down come April. Which brings me to this reality check. Becoming a food gardener and preserver of any significant means requires a reevaluation of how you live and eat. Logical? Maybe. Simple? Nope. I can go on and on about why I think living this urban-homesteading life is disjointed from the rest of the “real” world. Oh, you know I can. Suffice it to say that what starts out as spirited intention can quickly present obstacles. One, in particular, is the extra work and time all this takes. No doubt, you have to make some trade-offs. But in addition to the time needed is the skill — not just in the garden but in the home. What I’m talking about is the lost art of householding. Householding as a way to manage the workings of the home is not new. There is a long tradition and wisdom regarding the comfort that a well-tended home and homestead can offer, not just to ourselves but to the ecosystem at large. In fact, that interrelatedness of land and home, along with the stewardship required for both, was more than common wisdom: it was life. In a time when householding and homemaking have been relegated to the stolen moments between work, meetings, meals out, movies, and kid’s soccer games, it's hard to revive the spirit. Again, this begs back to our notion of time and what we, as urban dwellers, have filled with it. But even if we would want to enter back into some holy reverence with the act of householding, where would we start? In fact, other then the odious tasks of sorting laundry, washing dishes, and cleaning toilets, we hardly know what it might mean. That is why I’m happy to see all the folks showing up as the new mothers and fathers of invention, or should I say reinvention. Folks like my friend Chris Musser and her classes on some of the lost arts related to homemaking. She is part of the urban-homesteading group I talk about, but more than that, she's working on the steps needed to reconstruct this life. Certainly some of it is about meal planning, but more of it is about the relationships between our gardens and our homes, our sense of place and our planet. In many ways, it is about projected imaginations: living and putting up limited resources as if they were really, actually, limited. And that is a clue into what makes this somewhat surreal. Most of us are never snowbound or without the means and choices to live with the world at our fingertips. We can get anything, anytime, all day and night, so setting up home and life as if you cannot might seem like an silly affectation. But that is what it will take. To reenvision this urban-homesteading life is to superimpose conditions of one life on top of another one. It requires that we change our self-perceptions or, as Carlo Petrini (founder of Slow Food and, in my opinion, hot at any age) said during a recent Slow Food panel discussion, we must change our language. When asked by Michael Pollan what we as consumers can do to change the food system, Petrini replied, "To start with, stop using the word 'consumer' and substitute it for 'co-producer.'" He was making a point about language and how the words we use often defy the solutions we are seeking. I loved the way he questioned the ability to balance “development” with “sustainability." “An oxymoron," he insisted. I concur. For my part, I am thinking, writing, and living my life with an eye towards this new language. It is part of the premise behind '“The — my thoughts and writings on the linguistic conflict between natural systems and economic systems. But that was for the world at large. This winter, I turn my thoughts toward home and the notion of "living in the seamless," that investigation of living in a form and fashion within a world that challenges old pattern language. I suspect some of it will lead me to my role as a home steward, a householder, a homemaker. But what would or could those words mean in these new times? How can they transform our notion of work, time, and bottom lines if we value our homes, soil, food, and meals as gifts from the natural world? How will we envision ourselves when we recognize, then accept, that there is no way to get around the work (in kitchens and gardens) that is required? 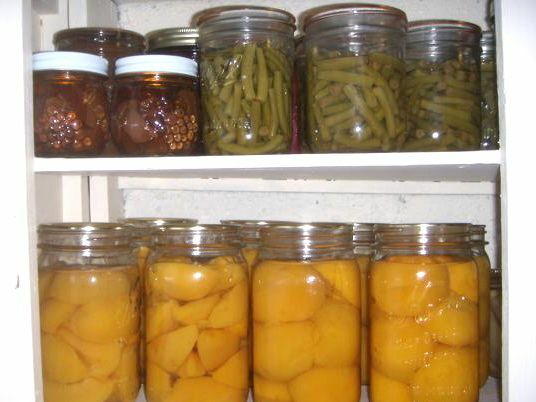 This coming spring and summer, should I figure out what the heck I am talking about, I will add it to the food-preservation series. I will teach householding in the context of gardening, preserving, and meal planning within the logic and language of seasons. I will try and imagine a new context for evaluating these efforts along with the opportunities and celebrations that will surely arise from it. Think of the relationships we will build and solutions we will create when we share in an effort that has heretofore been hidden by the notion and language of leisure, convenience, and take-out. Tall order, I know, but I’m hoping for an epiphany of sorts, something that gets me out of my mind and into a life, a joyous life that is infused with new rhythms and circle of co-conspirators committed to the same. Think community cider pressing, pickle making, garden harvests, and Thanksgiving. The notion fuels me on. So until or during that time, I’m turning applesauce into breads and cakes or, simply, eating it as dessert. I admit to looking at those sad little bowls as sorry replacements to “real” dessert but not, thankfully, my darling husband. He likes it layered between graham crackers and calls it his "applesauce parfait." God love him. I’m also learning to love a bowl of canned pears and peaches in a way I never have, with reverence for the time and season of their preservation. I’m thinking about summer’s cucumbers and beans, now pickled on the shelf, as a way to add crunch and enzymes to a winter meal when the kale, collards, and brassicas in the garden are getting to me. I’m thinking about innovative ways to use all those pumpkins — in ravioli with sage, sautéed in oil and topped with balsamic vinegar; in lamb and hominy stew; in fragrant couscous; in luscious pies. And I am searching out these recipes so I may put good food on our family table. And that, as it may well turn out to be, is the final punctuation for a garden, pantry, home, and life well tended. And that’s a language I can live with.